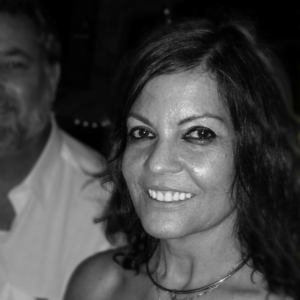 I was born in Cienfuegos, Cuba and grew up in my hometown of Lakeland, Florida. I paint with an obvious necessity to paint or perish, without fear at all to tread where no one else goes. I move my paintbrush with abandonment but also fierceness. I enjoy painting seascapes and naturalistic paintings sometimes flooded with color becoming passionate adventures in abstraction. I want my paintings to be beautiful, but most of all I want them to provoke thought. Inspired by the U.S. half silver dollar coin. 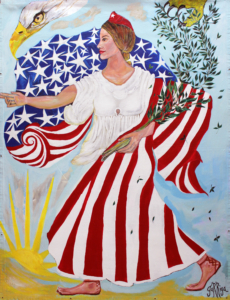 Liberty walks into the sunrise, a new day, shielded by our flag; her right hand welcomes, her left hand carries olive branches representing peace. In the sky, an eagle’s peak expands the gliding stars of our flag with his claw spreading peace.